Arte Útil archive, with new projects by Kulturni lift, Dina Rončević and working group k.r.u.ž.o.k. Arte Útil roughly translates into English as ‘useful art’ but it goes further suggesting art as a tool or device. Rejecting the idea that art can only be an instrument of reflection on itself and the world, the notion of Arte Útil insists on art as both a real social fact and an artwork at the same time. It operates as theorist Stephen Wright has named it on a ‘1:1 scale’. The Arte Útil archive, initiated in 2012 by artist Tania Bruguera in collaboration with Queens Museum, New York and Van Abbemuseum, Eindhoven, as part of the artist’s decade long research into the term, is an open source archive of over 200 case studies. It archive points towards an alternative history that might itself be useful when trying to understand what role art can or should play in our contemporary moment. In Gallery Nova, the Arte Útil archive will be shown on a modular wooden structure designed by Peter Zuiderwijk, Collective Works. The exhibition at Gallery Nova is co-organized by the Van Abbemusuem, Eindhoven and curator Nick Aikens, in collaboration with WHW and Martina Kontošić. Alongside the archive, artists Dina Rončević and the initiativeKulturni lift will initiate new projects. Aiming to examine Arte Útil as a practice, history and methodology within the context of Croatia and abroad, a series of presentations and talks by invited artists as well as meetings by working group k.r.u.ž.o.k.will be held during the exhibition. Dina Rončević (b. 1984), who for her graduation at Academy of Fine Arts in Zagreb professionally re-qualified as a car mechanic (2010), will initiate a new project entitled Internship – rattess in which she will teach young women to drive and maintain motorbikes. After using the bikes, they will then pass the skills and bike to the next user. The project Kulturni lift(Cultural elevator), initiated by Jelena Pašić and Matija Kraljtakes place in the elevator of the building in which they live. These ad hoc presentations include content that reflects on daily life in Zagreb. 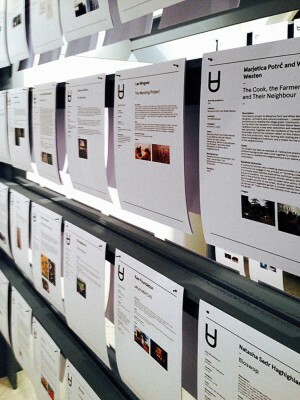 During the exhibition they will present three new editions of Kulturni lift newspapers, with various themes that connect art and everyday life. Working group k.r.u.ž.o.k., an informal group of cultural workers who irregulary and informally gathers to exchange knowledge, will organize two reading groups of texts tackling the question of the relationship between art and use. A talk by WHW will present Really Useful Knowledge, the international exhibiton they curated in Museo Nacional Centro de Arte Reina Sofía (28/10/2014 -09/02/2015). The exhibition presented a range of strategies and methodologies through which artists challenged hegemonic views on history, art, gender, race and class. The exhibition included approaches through which artists directly intervene in social reality and as a result are close to principles espoused in Arte Útil. As a whole, however, Really Useful Knowledge creates moments of tension with the broader principle connecting art and use. Really Useful Knowledge supports the right of art to be useless and simultaneously question how useful is art’s uselessness in present conditions that reduce knowledge, imagination and public education to tools of social reproduction. Curatoral collective What, How & for Whom / WHW (Ana Dević, Ivet Ćurlin, Nataša Ilić, Sabina Sabolović and designer Dejan Kršić) is active since 1999. It organizes a range of exhibition, publishing and discursive projects in Croatia and abroad, and since 2003 directs a program of Gallery Nova, Zagreb. Nick Aikens will address the implications Arte Útil, a type of practice that takes place in the field and away from the gallery, has for exhibition and institutional practice today. As theoristStephen Wright has argued, bringing Arte Útil practices into the institution challenges the three basic principles under which museums and galleries were founded – namely expert culture, the conservation of history through objects and the role of the Kantian ‘disinterested spectator’. Asking how institutions might facilitate these types of practices raises fundamental questions about the role of galleries and museums today and the relationship they have to their publics, a role which will invariably shift form the role of spectator to user. Nick Aikens (b.1981, London) is a curator at the Van Abbemuseum, Eindhoven and part of the curatorial team for the Museum of Arte Útil, 2013-14. He is currently co-curating Forward!, a solo presentation of the work of Ahmet Öğüt, He has edited and contributed to publications including Toward a Lexicon of Usership (ed. Stephen Wright, Van Abbemuseum, 2013), Too Much World: The Films of Hito Steyerl (Sternberg Press, 2014) and The Company She Keeps. Céline Condorelli *(Book Works, 2014). His articles and reviews have been published by *Afterall, Frieze and Flash Art. He is part of the editorial board of L’internationale Online and has been a faculty member at the Dutch Art Institute since 2012.